From cover to cover Seeing Things presents a series of interfaces: journeys in and out of real world situations; between real and mythical; between secular and spiritual; between existence and annihilation; between objective and subjective; from the present into the future; between first order experience and seeing things through new eyes. Such crossings involve a range of access points: doors, windows, gates, casements, an area of Ulster fen. 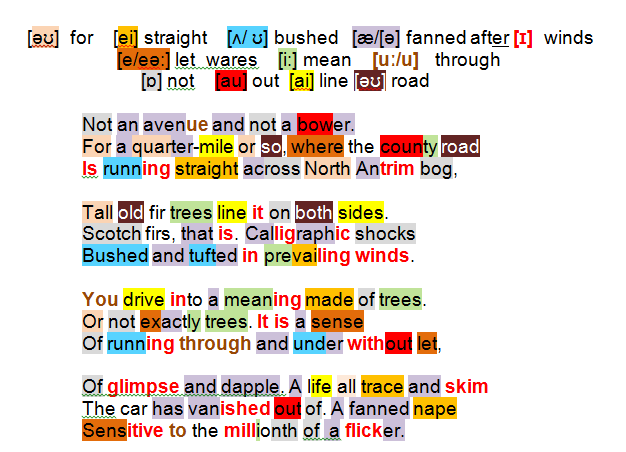 Heaney’s poem generates increasing momentum: his camera eye moves from measurable distance (quarter of a mile) to nano close-up (millionth of a flicker); his eye-brain coordination shifts from ‘easily recognizable objects’ to unrecognizable objects because too fast to register; the poet himself morphs from the man behind the steering wheel of a car into a Heaney/ Sweeney birdman figure at the point of lift-off. Driving across a very real area of Ulster to the north east of Loch Neagh (North Antrim bog) the reality of what the driver is seeing is presenting a dizzying challenge: the road bears all the hallmarks of an avenue, yet is not an avenue; the trees are not unlike but not a bower. The dominant tall old fir trees … Scotch firs suggestive of ‘avenue’ (line it on both sides) no longer seem to stand up to close inspection:, now calligraphic shocks, hieroglyphic representations, shaped by nature over time (Bushed and tufted in prevailing winds). The scene poses questions. At what point does an avenue cease to be an avenue, a tree cease to be a tree? At what point does speed translate thngs seen into a meaning made up of trees or not exactly trees? At what point does increasing speed (sense/ Of running through and under without let) replace identifiable objects by fleeting impressions of thermselves in patchy light (glimpse and dapple). The driver has reached critical speed: his living instant is reduced to basics (trace and skim); he ceases to be a poet behind the steering wheel (car has vanished) and trensmutes into the figure of his exiled king-birdman surrogate, Sweeney, poised to soar above his native Irish landscape, aerodynamic (fanned nape) and emotionally supercharged: Sensitive to the millionth of a flicker.